Sue and Richard Nicol of Wrenthorpe., building their garden room designed by Straw Works. WHEN the European frontiersmen and women arrived on the vast prairies of Nebraska in the mid-1800s they had no materials to build houses, so they cultivated the land and used the straw they grew to make homes. Everyone mucked in and learned from each other; there was shared pride in the creation of homes from natural materials that were warm in winter and cool in summer, thanks to the insulating properties of densely-packed straw. Barbara Jones, from Todmorden, was the first person to import the US way of straw bale building to the UK, and she won a Winston Churchill Fellowship to research the method in depth - creating her own eco-friendly model which used coppiced hazel instead of steel for the structure and clay and lime plasters instead of cement and gypsum. She is as much a pioneer as those frontier families, and after travelling through the US to study its late 20th century straw bale revival, she got involved in the construction of the UK’s first straw bale house in Wales in 1996. She already worked in the building trade, running a women’s building collective in London before moving to Todmorden and with a friend launching an all-female building company. She later started a not-for-profit social enterprise offering design, advice, consultancy, training and construction services to self-builders, architects, individuals and community groups. 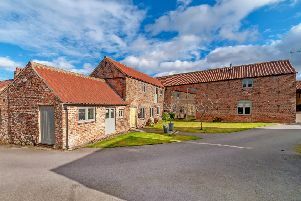 After studying straw bale building and doing a master’s degree in environmental architecture, Carol Atkinson, her teenage sons and friends and family did a course run by Barbara Jones, then built first a holiday cabin and then a two-bedroom cottage on the family beef farm near Howden in East Yorkshire. “We’ve now had almost 1,000 visitors to both of them, and so many comment on the special feel of the cabin and the cottage,” says Carol. Learning the skills to help build the two holiday homes also set Carol’s son Sam down the path of a career in straw bale building. Thanks to the good work done by Barbara and others who have followed her, as well as endorsement from the likes of TV presenter Kevin McCloud, there are now hundreds of straw bale buildings across the UK. We’re long past the point where anyone needs to be convinced that straw (unlike hay) is not especially flammable. Nor is it flimsy. And straw bales are reckoned to give three times the thermal efficiency of anything else on the market.The bales are stacked like Lego bricks then covered with breathable lime render on the exterior and lime or clay plaster on the inside. Today Barbara, partner Eileen Sutherland and a team of skilled self-employed craftspeople who work with them contribute to the success of Straw Works, which offers design, engineering and construction expertise, courses in natural building and on-site training. People are queueing up to do the courses but growth is hampered by lack of available land. “There are so many advantages,” says Barbara. “Probably the biggest is health. Allergies to building materials such as plaster, paint and timber treatments don’t happen when you build with natural materials. Nor do you get mould and condensation. Running costs are low. We built a salesroom for a an auctioneer, and they saw a 75 per cent saving in heating bills. Barbara is talking to smaller UK developers about training them in straw bale skills. However, she says: “Our value system is different to that of the construction industry in general. We want to make a high quality building that is affordable and will make people happy; their aim is to make money first and foremost. “We are looking at all sort of models to try to make more straw bale building happen for more people. One possible idea is a housing trust that sells the homes on condition that it can buy them back at an agreed price, discouraging speculation. A technical innovation that might encourage more high-density building with straw is the recent arrival on the market of prefabricated units of straw bales inside timber panels. Just slot together, plaster and paint.